Every Monday, Wednesday, and Friday, Isa Betancourt wades into Swann Fountain on the Parkway, and takes home a handful of insects to sort, catalogue, and pin. A simple fly — very small, not the trashcan variety — was floating on the surface of Swann Fountain in Logan Square on a recent Monday morning, right next to a curl of waterlogged paper and a chunk of dead leaf. According to Isabelle Betancourt, an entomology curatorial assistant at the Academy of Natural Sciences, it would be nearly impossible to isolate the fly without picking up the gunk around it. Using a slender, fine-mesh net (the kind a kid takes fishing), Betancourt can easily catch a fat wasp with a quick dipping motion, but these speck-size insects require a light jab, which, even when executed perfectly, often captures trash in the process. 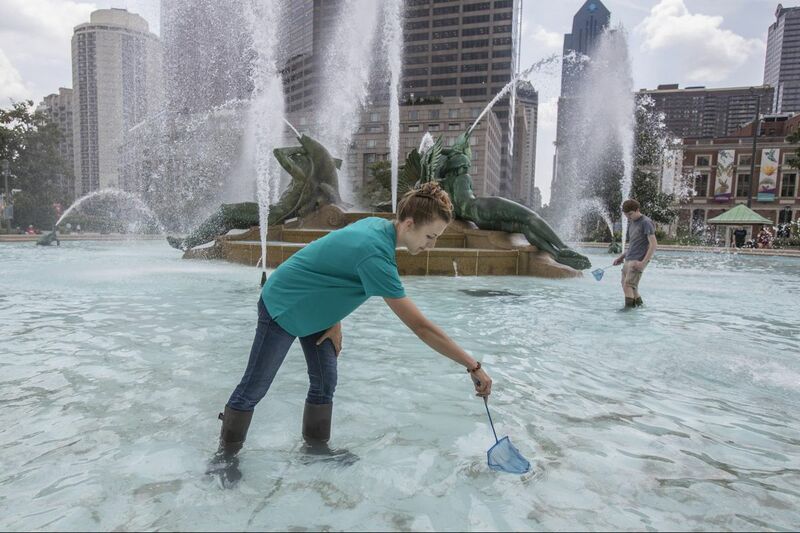 Betancourt, 27, is often found wearing bug-related jewelry and runs the Swann Fountain Insect Survey, an urban entomology project that is using the insects in Philadelphia's famous fountain to study the city's environment. Three times a week, Betancourt wades into Swann Fountain — just like the girls of Hallahan Catholic High School do every year on the last day of school — and catches every bug she sees to bring them back to the academy to sort, pin, and catalog. Isabelle Betancourt shows off some of the bugs she caught in Swann Fountain. Swann Fountain opened in 1924 as a memorial to physician Wilson Cary Swann, the founder of the Philadelphia Fountain Society, which had worked to make fresh water available, even in the middle of the city. Artist Alexander Calder had called the central brass sculptures "The Fountain of Three Rivers," as its main figures represented Philadelphia's three waterways — the Delaware, Schuylkill, and Wissahickon. At the foot of the statue, below the three main sculptures, Calder added shad, frogs, and turtles. The fish are angled upward with their mouths open, as if reaching for a fly. In a way, Betancourt's project resembles Swann's and Calder's, in that it celebrates the boons of nature in the middle of an urban landscape. When she finished her work on this particular Monday, Betancourt had collected the small fly in question, dozens like it, several bug-orbiting clumps of garbage, and some more "charismatic" samples — bees, wasps, ladybugs, and beetles. It was a light load, she said, perhaps because of the stormy weather. Urban entomology is a relatively new scientific field that looks at how the bugs in residential, commercial, and industrial centers reflect a city's environmental well-being. Insects are excellent bioindicators — meaning the presence or absence of certain bugs in a given sample can indicate changes in environment over time. That's why Betancourt is always sure to go for the little flies, even when it means collecting a lot of trash. Missing an insect means potentially losing an important piece of information. Betancourt isn't alone in this area either. Her colleague at the museum Greg Cowper has been collecting specimens in the walls of Eastern State Penitentiary since 2011. He has collected more than 1,000 species at the prison, whose fortresslike structure creates what Cowper describes as the urban equivalent of an island. Cowper keeps a small display of his findings in cell 25 on cell block 9. Betancourt's primary mission now is to collect baseline data — a large survey that future entomologists will be able to compare with their findings, to see if Philadelphia's climate is affecting its buglife. If later collections turn up more pollution-sensitive insects, for example, it could indicate that Philadelphia's waterways are no longer clean enough for their survival. In addition to the presence of specific insects, Betancourt is also looking at when certain types are present. "In the early spring, we get a lot of ground beetles — they appear all at once and then fade away quickly. Then we get dung beetles. Now we're seeing June beetles," Betancourt said. "It's like when botanists measured time in terms of when certain flowers bloom. We're tracking when different bugs emerge." Betancourt conceived of the project back in 2013, when, after eating lunch in Logan Square, she noticed dozens of insects dead in the water. "I kept my eye on it for a while," Betancourt said. "Then I decided it was worth jumping in." Part of the fountain's appeal had to do with the primary challenge of urban entomology. "If I set up traditional collection methods in a city," Betancourt said, "there's a high chance they would be tampered with, or who knows what. They would need to be watched." By contrast, Swann Fountain functions as a trap without offering the opportunity for interference. The most common trap is a flight-intercept trap — mesh hangs in a bug's flight path, the bug crawls up, and falls into a jar of ethanol. "Normally, we put that up," she said, "but this fountain does similar things. The spray of the fountain catches bugs midflight, much like an intercept trap." Another common collection method, called a bee bowl, consists of a brightly colored basin filled with water. Entomologists add a little bit of soap to break the water's surface tension, creating a set of light frequencies attractive to bees and wasps. Swann Fountain, with its continually moving water, "is the perfect mix of bee bowl and intercept trap." Isabelle Betancourt gathers up a bug from the water in Swann Fountain. A family who had enjoyed the cool water pays no mind to her bug expedition. The ideal science experiment is infinitely repeatable, a condition that can be hard to achieve in the fluctuating landscape of a city. Betancourt suspects the fountain, an important feature of Philly culture, will be around for a while. It's a fitting spot for the scientist's urban entomology project. "People don't have to leave to find nature," she said. "Bugs are around us all the time, even in the city."